In Matthew chapter five, the very first words Jesus spoke in 5:3 were, “Blessed are the poor in spirit, for theirs is the kingdom of heaven.” The Greek word used for poor in this passage is Ptochos, which literally means beggar: one reduced to beggary, asking alms or destitute of wealth. The application intended is that the Kingdom of Heaven is meant for beggars of Spirit, those who come to the Lord with nothing of their own to offer, just themselves, empty of self, begging to be filled with His Spirit and life. A beggar only gets what he needs for each day, needing to return again and again to have their base needs met. They are humble and dependent on another. After Joel and I graduated from college, I worked as the high school intern at our home church. That summer the students had put together a mission trip to Vancouver, British Columbia to work with Youth With A Mission (YWAM) in the inner-city. The main objective was to see God at work in the most destitute places of the inner-city. We served in homeless shelters, gave roses and prayed for prostitutes on Vancouver’s equivalent of skid-row and lived life as a homeless person for a day. We were sent out in groups without any money or food for a day in the inner-city to experience for ourselves what life was like on the streets. With maps in hand to the local shelters, we were encouraged to eat among the people and to ‘legally’ panhandle to see how people react. I admit it was a very humbling experience. No one was willing to give me money to buy a candy bar from the library’s vending machine. Now granted, my clothes weren’t the most run down and I may have appeared to have no true need, which was true, other than a day of grumbling for food. It dawned on me as I was studying this passage, that there are true and false beggars in the Kingdom of God. There are many who come to Jesus, longing to get from Him what suits their best interest. They stand on the roadways and byways of God’s eternal highway, begging for this and that, only to reject that which God offers them in response—that which He deems best. How many of us have given something to a beggar, just to have it rejected? We offer an apple but they truly long for money, or we extend the gospel but they choose their addiction. If this is true, then the opposite is equally applicable. 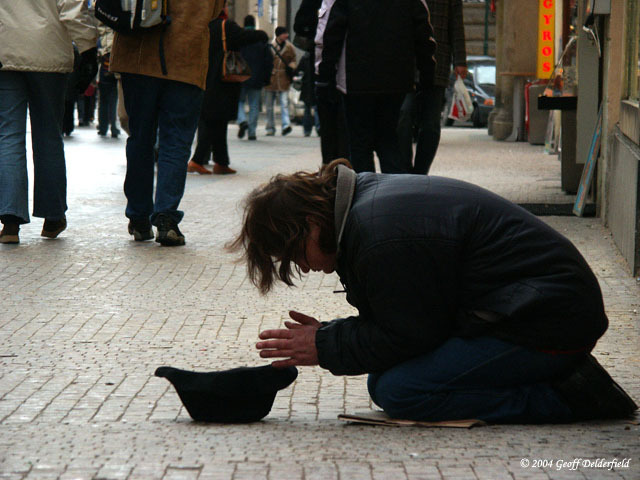 There are beggars who are truly in need and consider whatever they may receive a blessing to behold—they stand with open hands of need, willing to receive. To be a true beggar before the Lord, we have to be willing to accept whatever He may bring to our open hands. Have we shut them? “Shall we accept good from God, and not trouble?” Job 2:10. Lord, I come to you broken and empty, please fill me with your Spirit, the living water I need to live and breath. I am thirsty, fill me with you. I come to you as a beggar, with nothing, in great need of your strength, power, wisdom and love. Less of me and all of you today, Lord. Beggars can’t be choosers, so help me except what comes from your hands as coming in my own best interest. It is humbling. I know.